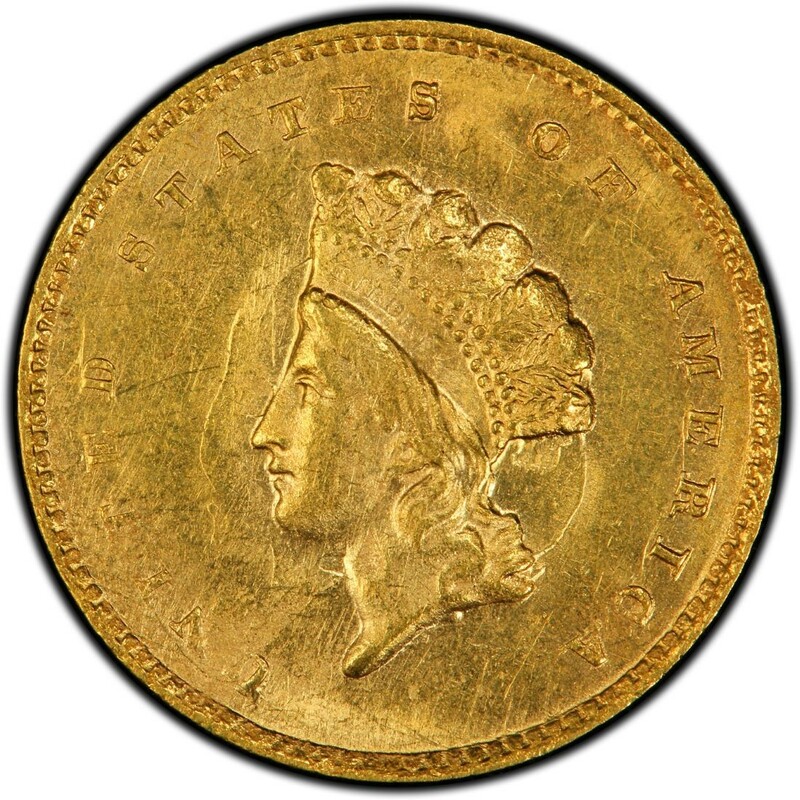 1855 Indian Princess Head gold dollars are popular coins among hobbyists who appreciate 19th-century gold coinage, particularly those who like coins with a bit of history behind them. The 1855 gold dollar is notable as the second year of the Indian Princess Head series, which spanned from 1854 through 1889, during which two design types were created. 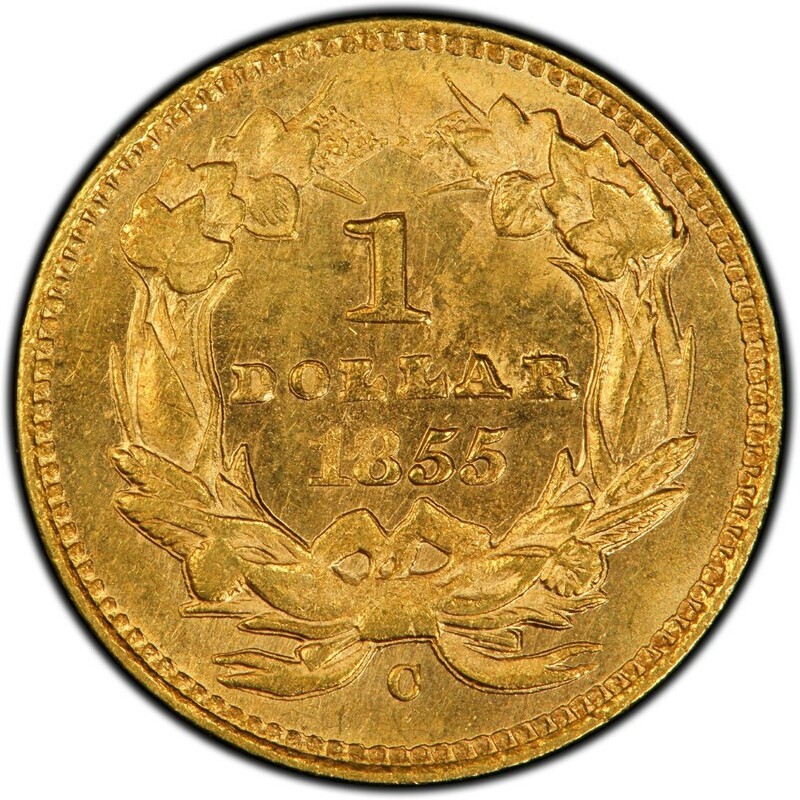 The 1855 gold dollar has a relatively smaller head than most of the latter pieces and is thus classified by numismatists as a “small head” type. *Values are for coins in a grade of Extremely-Fine 40. 1855 Indian Princess Head gold dollars were designed by Mint Chief Engraver James B. Longacre. Longacre is famous for designing several popular coins, including the Indian Head cent and 2-Cent coin. The Indian Princess Head gold dollar, while a precious metal coin, contains a relatively small amount of gold. In fact, the coin weighs just 1.672 grams and contains only 0.04837 ounces of gold. 1855 $1 GOLD * PCGS AU58 * INDIAN PRINCESS Head Dollar * $975++++ Nice BRIGHT !! 1855 $1 GOLD * PCGS AU55 * INDIAN PRINCESS Head Dollar * $625++++ Nice BRIGHT !! 1855 Type 2 Indian Gold Dollar (G$1 Coin) - NGC AU Details - Rare - Nice Luster! 1855 $1 Gold Princess Head AU50 PCGS Fully Lustrous - Extremely Choice Appeal! US 1855 $1 Gold Coin Graded NGC AU Details - Bent - Great Rare Coin! 1855 Type 2 Indian Princess Head $1 Gold NGC XF Details **Ex jewelry RARE DATE!! 1855 G$1 gold dollar type 2 nGC XF details for auction! 99C cents to open! 1855 Type 2 Indian Gold Dollar (G$1 Coin) - NGC AU Details - Rare Gold Coin!